We walked into the house about 8:30 at night. It was almost dark – not completely – which perhaps was why we didn't notice that the lights weren't operating at full strength. The floor, covered with plaster that had blown out from two different points on the walls, was the giveaway. Well, that plus the fact that the microwave, washing machine, stereo, cable, Internet and phone were fried. Over the next day or so we'd discover that the sprinklers, one of the a/c transformers and the garage door openers were gone as well. Our house had been hit by lightning. Fortunately, we weren't there at the time (our neighbors whose home had also been hit, said the bang made them jump out of their seats). Fortunately, the damage wasn't more extensive. Fortunately the entire place didn't burn down. Fortunately insurance covered it. There were many fortunatelys, we reminded ourselves over the next two weeks as we dealt with repairs and the aftermath. But let me be blunt. Having your house struck by lightning is a major pain. It's also a lot more common than I ever realized. 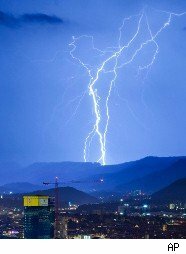 According to the Insurance Information Institute, lightning was responsible for about a quarter-million claims in 2008, a combined $1.065 billion in losses. That's roughly $4,400 per claim, not including deductible amounts. Mine will come out to be higher, but not by much. Claims were down a bit in 2009 (not as big a storm year as 2008) but over the last decade the number has trended up. For that you can thank your big-screen TVs, the many things you attach to them, and other new pricey household electronics. Add in losses to businesses and other entities and lightning produces $5 billion in total damage each year, according to Hartford Insurance. Ouch. Lightning doesn't strike all parts of the country equally. Florida, not surprisingly, is the hardest state hit, and other states along the gulf – Alabama, Louisiana, Mississippi, Texas – follow close behind. "In some places in the United States, they have 12 to 15 flashes per square kilometer per year," explains John Tobias, a lightning expert. In New Jersey, where my house is, the rate is 3 to 5 flashes per square km. You can gauge your frequency using the topographical map here. But wherever you are, some precautions make sense. Here are the big three. A lightning protection system. "Best way to protect your home is something been around for 300 years and that's a lightning protection system. It's the same thing Ben Franklin came up with," says Tobias. Actually, it's a more complicated version of it – a series of lightning rods that, depending on the size and layout of your house, intercept lightning strikes and pass them to the ground. Installing one is a job for a professional. It will cost at least $1,000 and potentially several times that, says Tobias, and it's not the materials that are pricey, he explains, it's the labor. Done right it will not only protect your electrical appliances but also guard your phone, cable and internet from surges that come into the home. Surge protectors. There are two types of surge protectors and you'll want to consider both. The first is like a vaccine that provides broad protection, it's attached to the electrical service panel. You'll want one to stop a 40,000 surge and costs about $500 to install. Individual surge protectors, which can be placed between individual appliances and outlets are significantly cheaper. But don't go too cheap. Notes Tobias: "Many surge protectors are useless against lightning strikes, but a few aren't. The key is that they have to be rated to a particular UL standard – UL 1492." And note: While some surge protectors look like power strips, all power strips are not surge protectors. Read the labels. Finally, unplug. If you know a storm is headed your way (or if you're headed out of town) consider unplugging pricey electrical appliances. Just never do it while a storm is in progress. "That can be more dangerous to you personally," says Tobias. "The odds are really low. But they're not zero."